The Goffin's Cockatoo or Tanimbar Cockatoo, Cacatua goffini, is one of the smaller cockatoo species. They weigh, on average, 350 grams - but the weight range of this species is 220 to 390 grams. They mesure about 31 centimeters from head to tail. 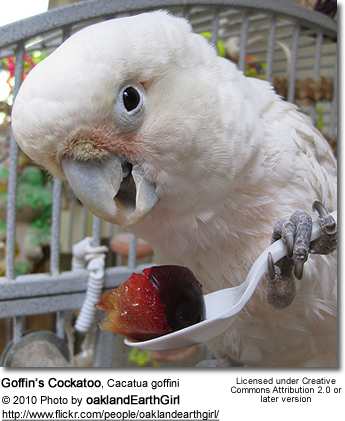 Goffin's Cockatoos are the smallest of all Cacatuidae. Males and females are identical in appearance. At first sight it appears to be a white cockatoo with some salmon/peachy/pink face feathers, and a pale grey beak. 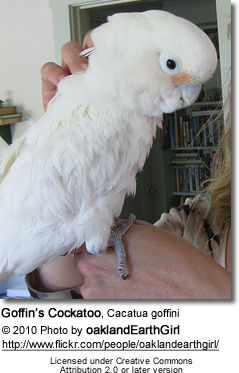 Like all members of the Cacatuidae, Goffin's Cockatoo is crested, meaning it has a collection of feathers on its head that it can raise or lower. Its body is mainly covered with white feathers, with salmon/peachy/pink colored feathers between the beak and eyes and also on the underside of the crest feathers. The underside of its wing and tail feathers exhibit a yellowish tinge. The eyes range from brown to black. The Goffin's Cockatoo is quite graceful in flight. Goffins are not known to be the best talkers in the parrot world, but many of them will learn a few words and imitate sounds they are exposed to on a daily basis, such as phones, microwaves, etc. 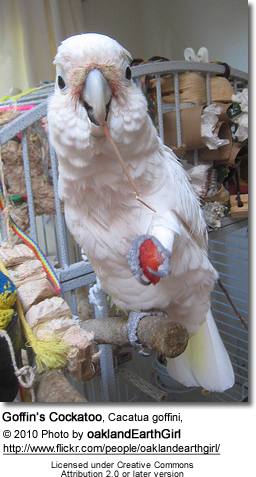 The goffins are less demanding and noisy than most of the other cockatoo species, and have a great personality to boot. 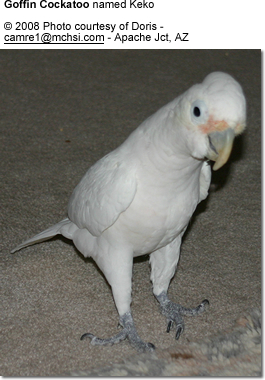 They make a good choice for people who would like a cockatoo that is somewhat easier to accommodate than the larger species. This does not, however, mean that keeping them caged all day without much attention is acceptable. There are many goffins out there who have developed severe behavioral problems under such sad conditions. They are loving, playful and need to be an integral participant in family life. 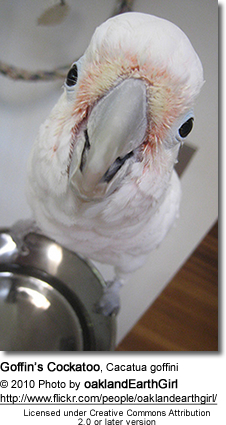 This is not a "cage bird" - but a fun and extremely loving companion for the right bird owner. Talking in general terms, cockatoos certainly demand a lot of attention, but are appreciated for their exceptionally loving, devoted personality that is second to none. 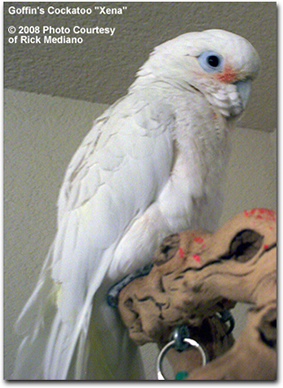 Cockatoos require an extremely dedicated owner who is willing to provide significant and meaningful attention to these intelligent parrots. 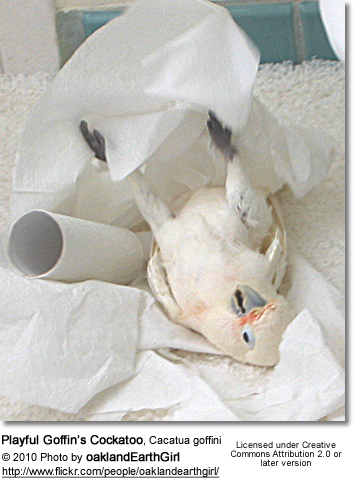 They require consistent training from a young age to ensure potential cockatoo owners enjoy a bird free of destructive and annoying habits.